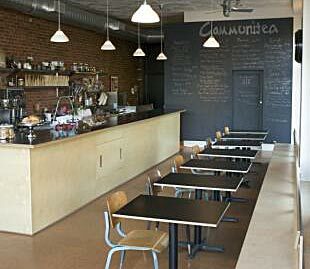 I finally got around to visiting Communitea on Friday afternoon. Though Cathy B. and I had attempted to go there the previous Sunday, it had been closed for Easter. So on Friday when I realized I had about two hours to kill, I took the N to the 7 to Vernon Blvd. It's not that long a ride, just annoying that I need to take two trains to go to an area that is fairly close to Astoria. And yet, it was nearly another city altogether. There's the feeling of an attempt to be interesting, whereas Astoria has seemed to give up (with the exception of the constant raising of new apartment buildings which a native Astoria could not afford.) I stopped into a vintagey store called Just Things, where I was able to find some decent books and had a look at some old toys - and some teatime hats. Some real winner had put graffiti on the front window of Communitea. So the owners called in an artist to work over it, and "make lemonade" out of the lemon of that situation. I guess even in a pleasant neighborhood there has to be property damagers. My first impression on stepping inside was Wow, there are more guys here than girls! There was an affable staff, and one orders at the counter - they were nice about not putting tomatoes in my curry chicken sandwich. The sandwich was really tasty, though a bit heavy on the mayo. The tea, which was a sencha with cherry blossoms, was mild and refreshing. As I sipped, I stared at the black chalkboard menu wall, and was happy to see they have a wide variety of $4 smoothies, other hot drinks like Ghiradelli hot chocolate and hot cider: though I'm a tea person it's nice to try beverages of all sorts. When I was bored of reading the menu wall and reached for the New Yorker magazine, which was there amongst other strewn about newspapers and magazines. I think that's rather courteous of the owners to provide. Not to mention the wi fi for those bearing laptops. Then I got back to studying for that night's book study. Looks like a place I might try with you one day...we could walk there and take the train back or vice-versa...it's a long walk, but I've done it before-that way you can have 2 scones guilt free heehee. I can't wait to go! I must go soon...sounds lovely. And Wi-fi? Oh boy!